George Clooney has been in 19 movies that I’ve seen since Batman and Robin. And I have at the very least liked 16 of them. This is an impressive track record for any actor, let alone for an 80’s sitcom guy who played the greatest character ever in the worst movie ever (YES, hyperbole, WHY NOT?!). It’s the track record of clear film-lover, who made enough money from a terrible movie that he realized he could essentially be the Charles Foster Kane of actors, starring in movie after movie that doesn’t do great (the occasional Ocean’s movie aside), simply because he has the clout and knows he’ll never go broke. And because he seems chiefly interested in starring in films that feel like forgotten gems of the 60’s-70’s auteur period – when conspiracy thrillers didn’t require explosions and action movies doubled as character studies – George Clooney has pretty much become my go-to actor for Movies I’m Pretty Sure I’ll like. Add to this list The American, a great entry into what I like to think of as the “Waiting for the other shoe to drop” sub-genre of action/thriller. This was pretty much perfected by Sergio Leone’s later westerns, and brought to its American apotheosis with Unforgiven, a movie where the audience is asked to wait nearly two hours for Clint Eastwood to do something Clint Eastwood-y. But in its pacing, it really resembles Michael Hodges’ British gangster movies Get Carter and I’ll Sleep When I’m Dead, both films that make the audience understand up front that the protagonist is a Not To Be Screwed With, then let them wait for things to take the ultimate, violent turn they know is coming, but are never sure when. 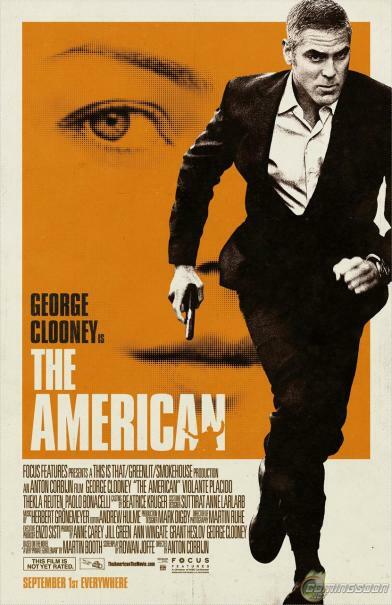 Clooney’s character in The American has clearly lived the life those films hinted at – he’s too old to have survived this long as an assassin/gunsmith, but we can see how: though we’re told precious little, his exhausted eyes and the way every unexpected noise makes him flinch just slightly tell us that he’s stayed alive through a punishingly effective blend of paranoia and melancholy. In one of the film’s few bits of flowery dialogue (seriously, “terse” has never been a more useful description), a priest Clooney has accidentally befriended rightly points out, “You must believe in Hell, because you’re clearly living it.” This is a film about a killer who’s lived too long and suffers every day because of it, doing the proverbial “one last job” while constantly wondering who’s going to put a bullet in him, and when. And because of Clooney’s internalized performance and the drawn-out pacing, coupled with the idyllic Italian setting and, well, the insanely-attractive allure of a local prostitute, the audience is made to feel every bit of the sadness and tension built into the protagonist’s being when he occasionally tricks himself into thinking things might turn out okay. This is NOT a movie for everyone. In fact, I do feel pretty bad for anyone who saw the commercials last September and thought they’d be watching a riveting action flick. It’s not. It’s a movie about a gunman who’s lived just long enough to assume everyone has a gun hidden underneath the table and pointed at him. So: not an action film. But as a slow-burn suspense movie, it’s really, really good.